Sandy and Jerry Pressnell working together and making it happen!After spending five minutes with San Clementeans Jerry and Sandy Pressnell, owners of Doheny Plumbing, it’s easy to understand how they, have built such a successful business. With a Karma-like, be honest, do it right philosophy, and 27 years experience, their venture has grown from a one-man, sometime two-helper shop on Doheny Park Road in Capistrano Beach, into a duel location business on Avenida Granada in San Clemente, finally ending up as a 14-truck enterprise in one of Talega’s newest business parks. This trek to success began for the Pressnells when Jerry became the father of two small children within 17 months and realized he needed to earn more money. Having spent his early years in town working at a variety of jobs, he knew the way he could earn the money needed to support a family was to focus on the plumbing skills he had learned in childhood working with his father. Using those skills, Jerry began picking up small plumbing jobs here and there. 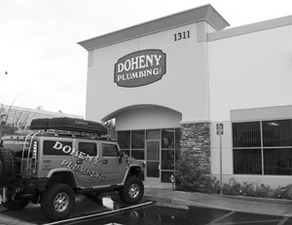 Before long his work came to the attention of John Collins, a local commercial property owner, and that connection plus other referrals in the area, birthed the business that would soon be known as Doheny Plumbing. The recording of that report has since become a trademark of Doheny Plumbing, generating a great deal of business for Jerry and Sandy. Today, they are still amazed at how many people see and read those reports. As an extension of the surf report idea, one of Jerry’s employees, an avid fisherman, got the notion to add the fishing report to the board each day. They began copying the fish reports put out by Dana Wharf Sportfishing onto the boards as well. Due to the publicity it has generated, the owners now give the Pressnells two free tickets a month to fish on their boats. While those reports may bring the customers to Doheny Plumbing, it is the quality of their service that retains them. In Jerry’s opinion people are practically on their knees today begging for honest, efficient and thorough service. To accomplish that he and Sandy pre-screen all of their employees very carefully, making sure they are qualified to service their customers in the manner they advocate. And, using the latest in electronic, environmentally friendly equipment, the Pressnells and their employees work hard to give people up-to-date installations and solutions to their plumbing needs. Located in the Talega business park Doheny Plumbing keeps up with the times. One of the newest trends in installations available at Doheny Plumbing is the “On Demand” water heater. Old-fashioned water tanks can now be replaced with a wall-mounted heater box the size of a suitcase. This heater doesn’t store water, as in the past, instead, water runs through heated, copper tubing coils creating instant hot water … and the best part is, it never runs out. Amongst the very latest, state-of-the-art service trucks running out of Doheny Plumbing daily, are specially equipped vehicles that make their work easier and more efficient. One, a powerful version of the oft-used vacuum truck, houses a holding tank for accumulating and dumping waste, rather than having it run down the street into the ocean. Another of their vehicles hosts electronic camera equipment that can be threaded into pipes to determine the exact location of any blockage. And still another harbors equipment that can locate underground lines before digging can destroy them. Jerry Pressnell became “a really good plumber” working with his dad operating backhoe equipment, digging and installing pipe for large plumbing operations in Ohio. He worked with him until he graduated high school, then, after continually receiving pictures from his cousins depicting their good times on the sands of California, he decided to join them in Redondo Beach. As a young man on his own, Jerry eventually found work with Hobie Alter and was employed there for two years. During that time he met his future wife, Sandy, on the beach by the Pier, and it was love at first sight. “Sandy’s brother was surfing at the pier and she came with him. I knew immediately when I met her that I was going to marry her,” Pressnell explained, a twinkle in his eye. Thirty years, three children, and seven grandchildren later, Jerry and Sandy are still happily married, and for the last ten years they have been working and playing together 24-7. While the Pressnells take their work very seriously, they also know how to play. There was a time when the couple lived on a boat for a couple of years, and since Jerry got his pilot’s license they have been spending their free time flying their small private plane. But it isn’t just the larger-than-life activities he and Sandy enjoy, they spend lots of time experiencing the simple pleasures of running on the beach trail and in the hills behind town, and strolling hand-in-hand down Avenida Del Mar.